The most common type of hip arthritis is called hip osteoarthritis. People who talk about hip arthritis are usually referring to hip osteoarthritis. Hip arthritis is a disease that affects the cartilage in the hip joint, which is a shock absorbing smooth surface that covers the part of the bones that move against each other in your hip joint when you move your leg. This allows smooth pain free movement in the hip joint. 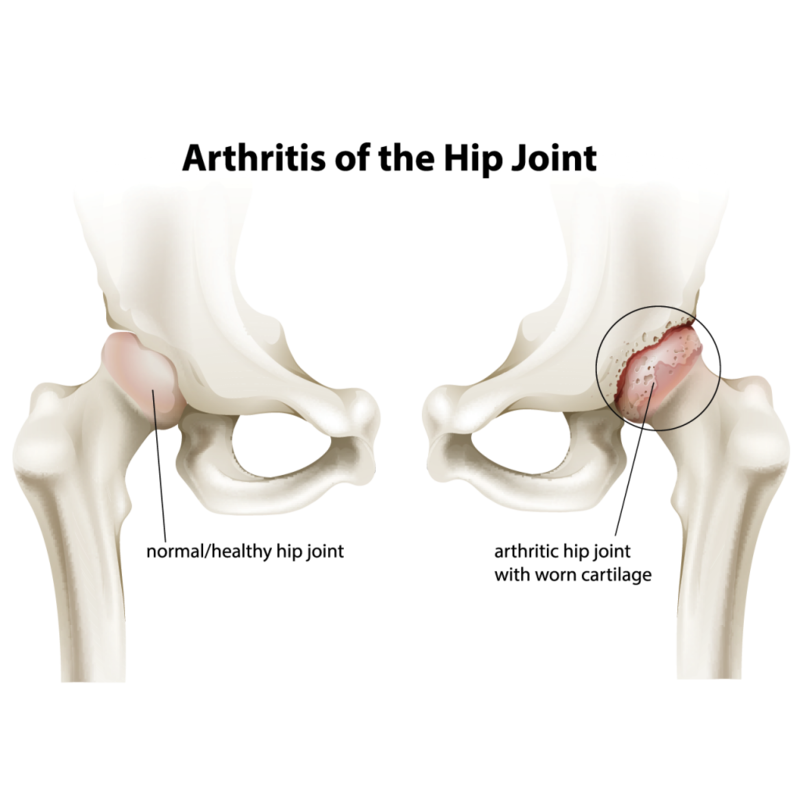 In an individual with hip osteoarthritis, the cartilage breaks down and wears away, losing the shock absorbing smooth surface between the bones. As a result, the bone underneath the cartilage rubs together, causing pain, swelling and loss of hip mobility, as well as development of little bony protrusions called bone spurs. The development of hip arthritis is a process that occurs over time. Some examples of things that can make people more susceptible to developing hip arthritis are those who are over-weight, those who have had previous hip injuries, those who are older, those who engage in activities that put increased stress on the hip, those who have a congenital defect in the cartilage and those with muscle weakness. Physiotherapy can help manage hip arthritis, and early physiotherapy intervention can help delay the onset and progression of hip arthritis. As hip arthritis progresses, it may get to the point where surgical intervention is necessary, however the more mobility you have and the stronger your muscles prior to surgery, the quicker the recovery and the better the outcome. Even if you are a surgical candidate, seeing a physiotherapist can benefit your hip arthritis. An individualized exercise program including range of motion exercises, muscle strengthening and stretching. As you heal, the physiotherapist will progress your exercises to make them more functional to help you reach your goals. Individuals with hip arthritis usually experience hip and groin pain, restricted hip movement, weak hip muscles and joint instability. These symptoms can make it very challenging for people with hip arthritis to engage in regular routine movements, such as climbing stairs, driving and getting up out of a chair. Hip arthritis also commonly causes hip stiffness, especially first thing in the morning.